We’ve came across and reviewed a lot of binary trading softwares, but Google Trader is the first to claim that they operate based on Google Search Engine’s algorithm. Can they be trusted? Is Google Trader a Scam? Let’s find out in our Google Trader review. A binary trading software powered by Google Search Engine? Google Trader has one of the most outrageous claims out of all the binary trading softwares we’ve reviewed. Recently, we reviewed APL Bot by Gunnar Erikkson, another binary trading software scam that rides on the name of Apple Inc, but even that was not as far-fetched as Google Trader scam. Google Trader follows the typical binary software scam template. Firstly, the homepage starts off with an unrealistic and hyped up headline to attract your eyeballs, and get you excited for what they have to say in the sales video. 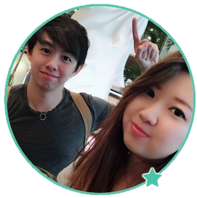 Once you take the time to watch their embedded video, you are bombarded with fake testimonials of people thanking Google Trader for their new-found wealth and financial freedom. Did you know that you can pay $5 on Fiverr and get someone to read your script like a real testimonial? I’ve seen some of those guys in other scam videos, so be very skeptical when you come across this kind of testimonials. If you have time on your hands, you can watch the full Google Trader scam video on YouTube here and see what they have to say. As advanced as it sounds, Google Trader is nothing more than a binary software scam. Before we continue with the review, let’s talk about how binary trading works to make sure everyone is one the same page. If you have experience with binary trading, you may skip this segment. Binary trading is basically trading stripped down to its simplest form. Instead of analyzing financial news and following market movements, with binary options, you only predict if the price of an asset will rise or fall after a short period of time, usually between 30 seconds to minutes. This is how it works – for example, I predict that the price of gold will drop 5 minutes from now, and I bet $50 on a 5-minute contract. When the contract expires, and the price is indeed lower, I win and I earn a certain percentage of what I bet, let’s say 60% (which is $30). But if I’m wrong, I lose the entire $50 that I bet. To put it simply, binary trading is not that different from gambling. There’s no good way to predict the market’s movements in such a short period of time. In most cases, traders depend solely on luck and gut feelings. Even if you manage a 50% win rate, you will still lose money due to the uneven winning vs losing payout. The difference in payout is how the brokers make money. According to Ben Williams, the alleged owner of Google Trader, winning binary options is extremely easy with his software because Google Trader only picks the winning trades for you. There’s no risks at all! 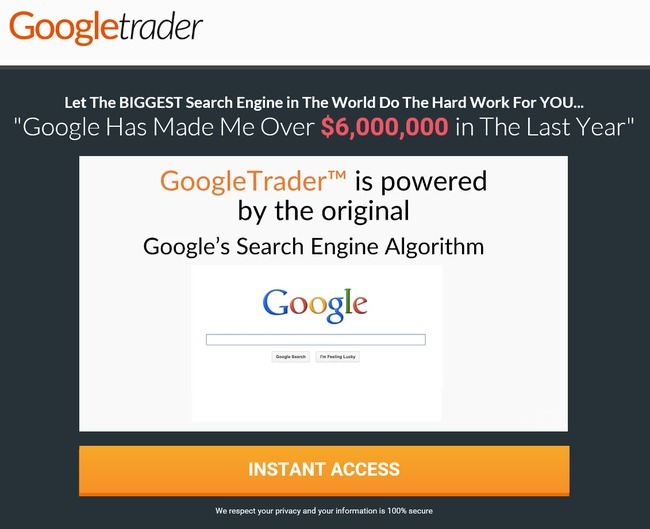 Google Trader bot will run completely on autopilot, and is 100% guaranteed to make you money. Can you believe it? Seems like we will have a lot of millionaires born from Google Trader alone! Apparently Ben Williams wants you to believe his outrageous lies, and he does so by using Google’s name. Instead of turning you into a millionaire, you are actually turning Ben and his team into millionaires by handing your hard-earned money to them. 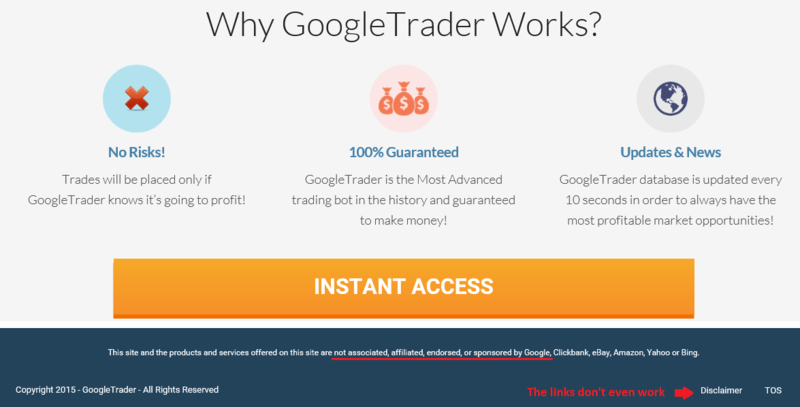 However, if you take a close look at the fine prints at the bottom of their page (underlined in red in the previous image), you’ll realized that Google Trader has nothing to do with Google at all. Why does Google Trader include such fine print at the bottom of the page? It’s used to protect them from legal actions by Google, as they are required by regulation to state their non-affiliation with Google (despite using its name blatantly to advertise the software). Not only that, if you try to view their disclaimer and terms of conditions, you will be brought back to the homepage. Don’t trust a page that doesn’t even put up a proper disclaimer and TOS page. Why Does Ben Williams Promote Google Trader? You may wonder why Ben Williams goes as far as to “borrow” Google’s name to promote Google Trader, just to give it away for free. Firstly, if you decide to use Google Trader and register for a binary trading account through their sales page (which contains an affiliate link), Ben Williams and the team behind Google Trader will earn a sum of referral fees when you make your first deposit. Not only that, Google Trader will continue to make money off you over a long period of time. They earn a commission for every trade that the bot makes for you. The scary part is, Google Trader runs completely on autopilot. The trading frequency and trade amount is fully determined by them. To put it simply, they can decide how much commission to earn off you, as long as you still have money in the account and use their bot to automate your trades. Ben Williams will profit regardless of whether you make or lose money, ALL BY RISKING YOUR HARD-EARNED MONEY.